There are so many dogs out there with allergies. Shiner suffers from them herself, but I think hers may be more associated with the environment rather than food. Although I do think she does better without many grains in her diet. Finding good dog treats that are allergy free can be a chore sometimes. 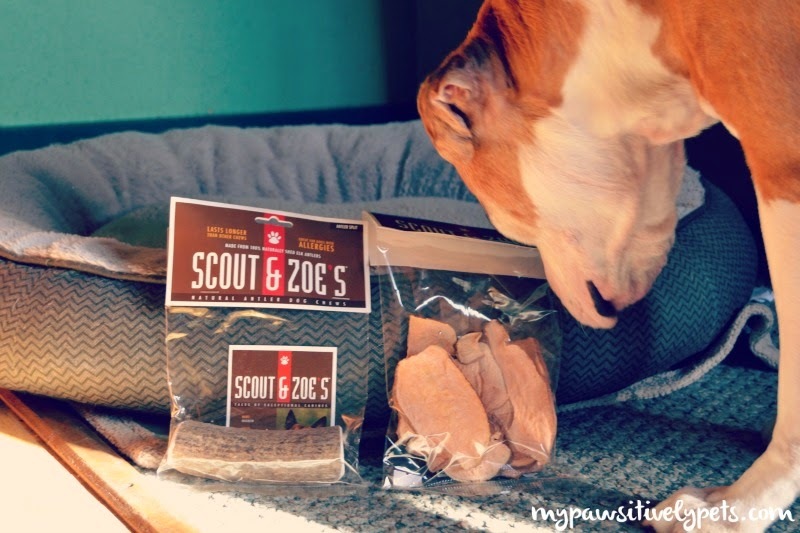 Shiner and I were asked to review some dog treat products from Scout & Zoe's which is a company that was created solely for the purpose of creating allergy free treats and chews for dogs. The creator of Scout & Zoe's, Cindy, wasn't able to feed her furry family members certain foods because of their allergies. Since her dogs (yes, their names are Scout and Zoe) are allergic to bovine, they could not eat beef bones, rawhides, or anything beef-flavored. That really narrows down your options if you think about it. The products that Shiner got to taste test were Scout & Zoe's Natural Antler Dog Chews and their Sweet Potato Treats. Shiner has had some of their Sweet Potato Treats in the past, but it was only a small sample. First we tried the Sweet Potato Treats. Shiner was really diggin' these things! Their texture is very crunchy and crispy, just like a chip for dogs. These treats are made from USA grown fancy sweet potatoes that are dehydrated in central Indiana. While I was trying to take a picture of Shiner waiting for her Sweet Potato Treat, she decided to jump up and take it. I guess she was tired of waiting! Next up, Shiner tried an Antler Dog Chew from Scout & Zoe's. They offer many different sizes of these chews for dogs. The antlers are naturally shed and all natural. Ours was one that was split down the middle with the marrow exposed. Shiner has never had an antler with the marrow exposed before. She went right to work on her new treat, and she loved it! It could her busy all night one night until I took it up a few hours later. Here's a video of Shiner enjoying her Scout & Zoe's Antler Dog Chew. The next day, she was back to work chewing her antler away. I checked to make sure everything was still in order, but I noticed a large pointy and sharp piece of antler sticking out. The marrow on the inside also seemed a little sharp and jagged, so I had to end her fun. Poor Shiner. She enjoyed it very much while it lasted at least. 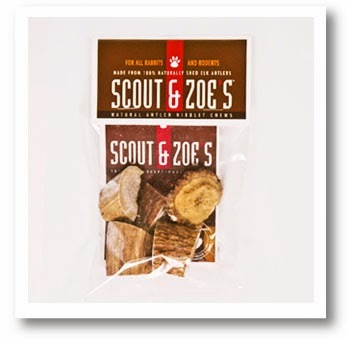 On a separate note, as I was browsing the Scout & Zoe's website I came across this product - "NIBBLET Chews". These are more bite-sized antler chews which are made for rabbits, guinea pigs, mice, RATS, and birds to help keep their teeth and beaks healthy. We did not actually review these treats, but I had to share them once I saw them. 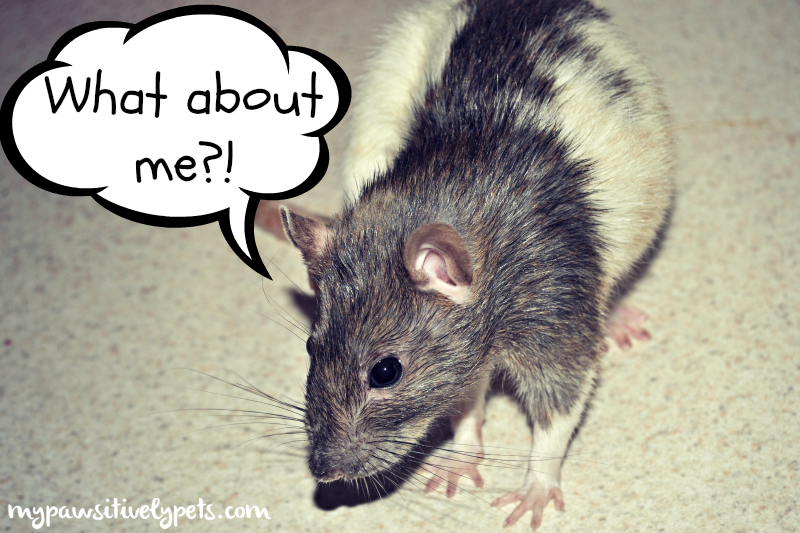 Nibblet, my pet rat, has been wondering why she was not included in this review! I LOVE that Scout & Zoe's offers products for exotic pets. I also found some really nice products for birds, including perches, toys, and calcium powder. The calcium powder is good for our reptile friends too. 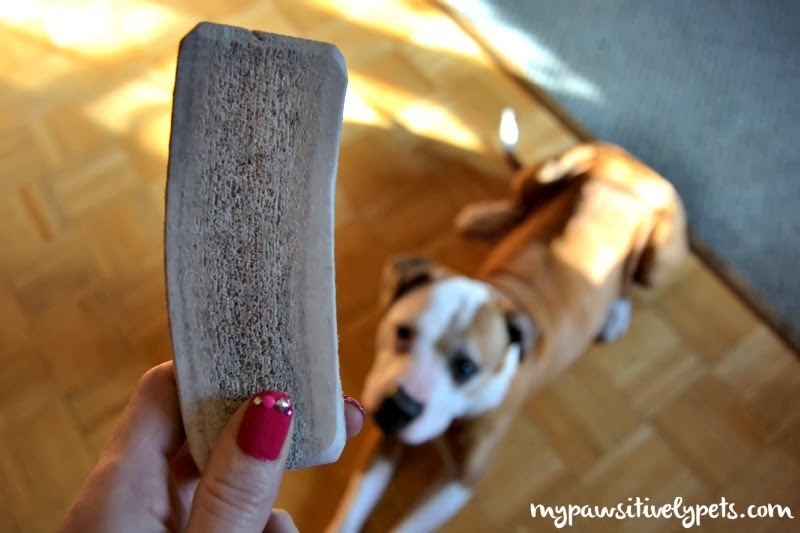 Even though our Antler Dog Chew experience wasn't perfect, we still love this brand and the allergy free dog treat force that drives them. And I couldn't be more pleased to see that Scout & Zoe's offers high quality products intended for use by small mammals, birds, and reptiles. To see all of Scout & Zoe's products, visit their online store here. 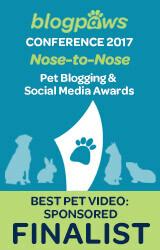 We received products from Scout & Zoe's in exchange for an honest review. All opinions expressed here are our own and honest. No other compensation was received. 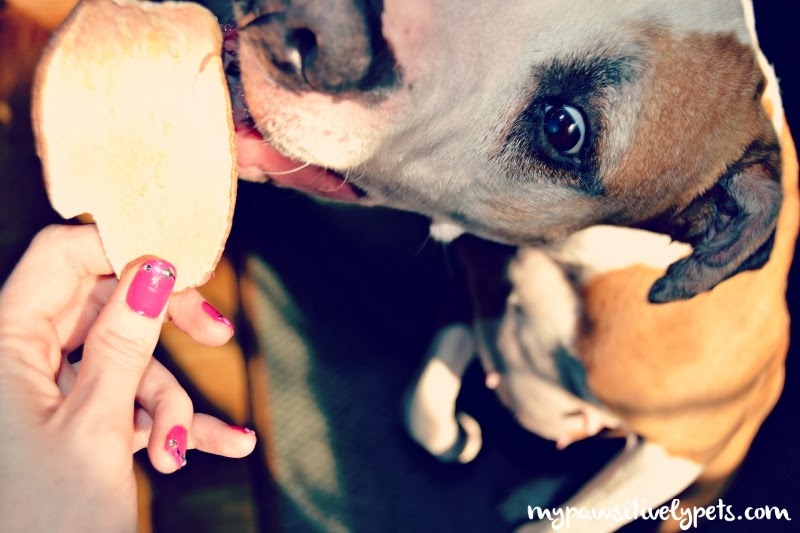 Shiner looks very enthusiastic about the sweet potato treat! Allergy free yum is always such a great find!!! I'm a huge fan of Scout and Zoe's - so much so that they inspired the names of our puppies. We made along list, but I kept coming back to Scout and Zoey and then I realized why I loved the pair. 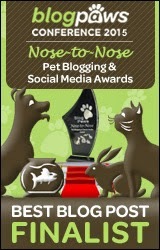 Thanks for this review; this is a great reminder for me to order some of the chicken jerky treats for our dogs. I met the owner of Scout & Zoe's at an event here a few years ago. 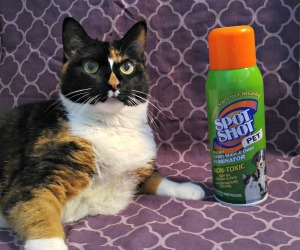 I really liked her, and love the products this company makes! I had the same trouble with an antler recently. I thought those shards would surely get stuck in Bentley's throat so I also had to sneak it away. We LOVE sweet potatoes though! It seemed fine at first... but I think maybe sitting overnight without being slobbered on made the marrow get sharp or something. I shouldn't be too surprised... there is not much that can withstand Shiner's chewing! Thanks Ruckus! New experiment with the gems, they look nice at first but don't stay on very long.